Visitandine, a simple French sponge cake with a 'pure butter-and-sugar' flavor was this week's assignment for French Fridays with Dorie. Apparently in the pastry shops in France, they are baked in madeleine molds, financier pans, small fluted tartlet pans or tins that turn out little mini muffins. Like her friend Claudine Martina, who gave her its recipe, Dorie however likes to bake hers in a pie plate and serve wedges of visitandine at teatime or layer them with jam, whipped cream and berries for a pretty and elegant dessert. In her words, this cake "is perfect plain or paired with jam, fruit, chocolate, citrus curds, cream, frosting or glaze." 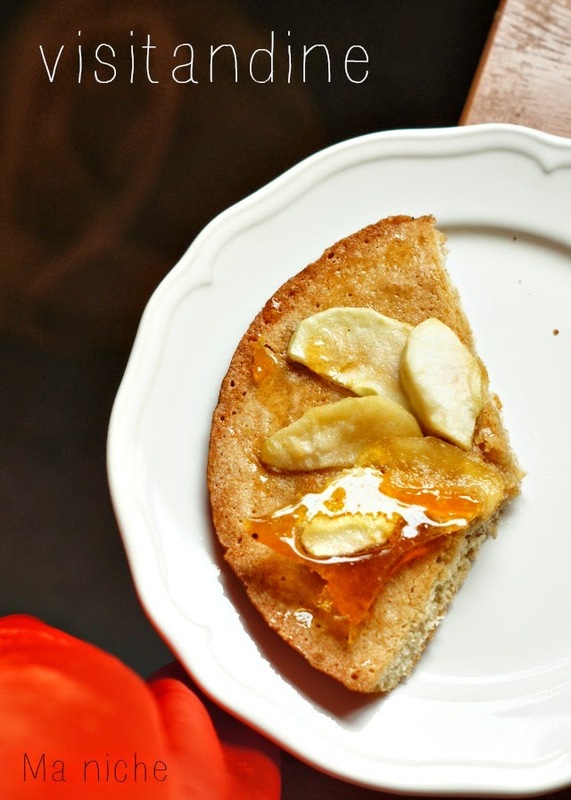 Taking her cue I decided to use it as a base for a caramel apple galette.. and that turned out to be quite a treat ! 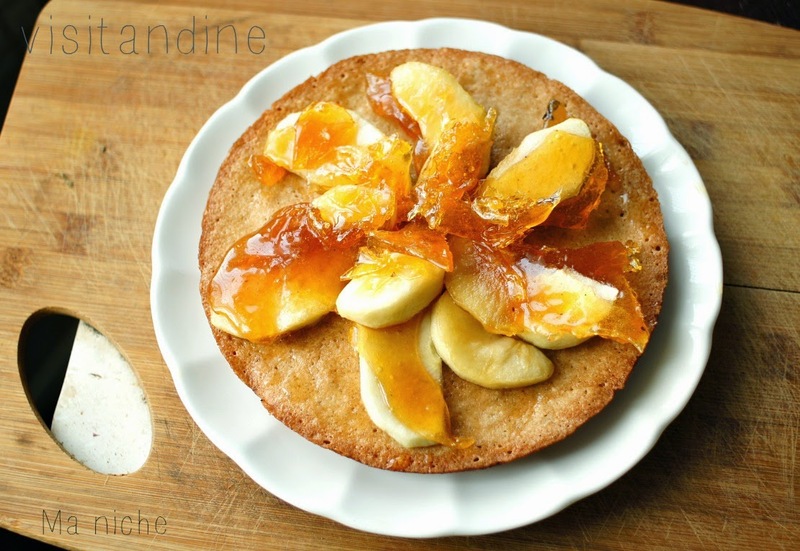 The recipe for Visitandine is quite similar to that of Financier. Brown the butter, add it to the mixture of flour, salt and sugar, add vanilla extract to it then stir in the egg whites which have been beaten until stiff peaks were formed. Now bake the cake in preheated oven and thats it. You are done. Though Dorie recommended baking the cake in a springfoam, layer cake, or fluted porcelain or glass quiche pan, I baked mine in the iron skillet. I halved the recipe and baked in my 8 inch skillet for 30 minutes. Okay. The cake had actually started pulling off from the sides after 25 minutes.. but I let it sit in the oven for 5 minutes more... just in case... 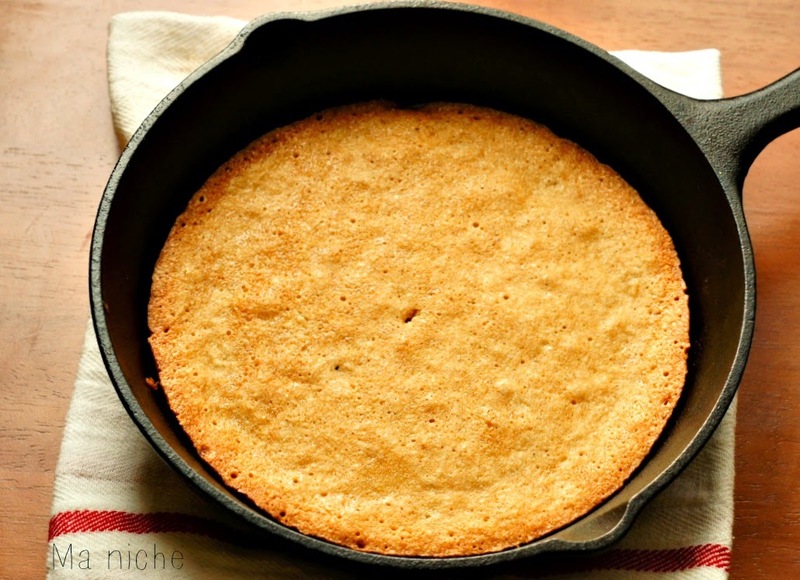 The extra baking time or the iron skillet might have made the cake a little biscuit-y. My husband however liked it ... infact he loved it so much that three of its wedges disappeared instantly. Finally a word about the caramel apples. Well this is the first time I tried making it. Using the leftover sugar syrup from the candied lemon peel (that I made for the Julekake) was the sole motivation behind making the caramel. I know I did a clumsy job of it... but the flavors were simply awesome. The combination of citrusy sugar and sweet apples was a complete revelation ! Also pairing the cake and the caramel apples with the rum-scented pastry cream that I made from the leftover yolks from visitandine felt like a good idea. Overall this dessert was a hit in our house and we really liked it. 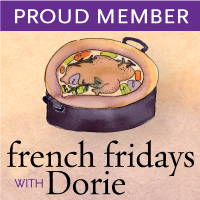 Visit French Fridays with Dorie to know what the other members thought about this cake. You can find the original recipe here For more such delicious recipes order your copies of Around my French Table and join the Doristas in this tasty adventure. Caramel apple sounds like an absolutely delicious way to eat this cake! Ok, you had me at Rum Scented pastry cream and caramel apples…sounds utterly delicious! I think your cake looks lovely! Thanks for the warm welcome. My husband went back for seconds too. Yum! I love the sound of the caramel apple/rum pastry cream combination on top of this delicious cake. I want to come over for a slice. Oooh, I would have LOVED your caramel apple topped visitandine! Looks scrumptious! Delicious Love those caramel apple , I learned name of new dish. I think this is one recipe we regret making only half! Love the apple caramel and pastry cream you topped it with! Tanusree, nice presentation with the caramel apples - must have been delightfully delicious! Oh, wow - I want to try this some time! Sounds so delicious with this cake. I like that you used a cast iron skillet, too. It must have made for an easy clean up. Nice job! Brilliant idea to use a cast iron skillet. I had such a large springform pan the cake was quite flat. Nice topping going to remember it for Fall. Well I think I really REALLY would have liked it topped up this way. Its a rustic "cake" and quite the base for something like this. All that butter in there seems even more perfect than strawberries now that I think of it. Love the way it's in the skillet! Brilliant idea for the caramel and apples.That would taste amazing! What a great idea to use a cast iron pan too. Looks just wonderful! I am loving the cast iron skillet as a vessel. Those crisped edges must have been to die for! 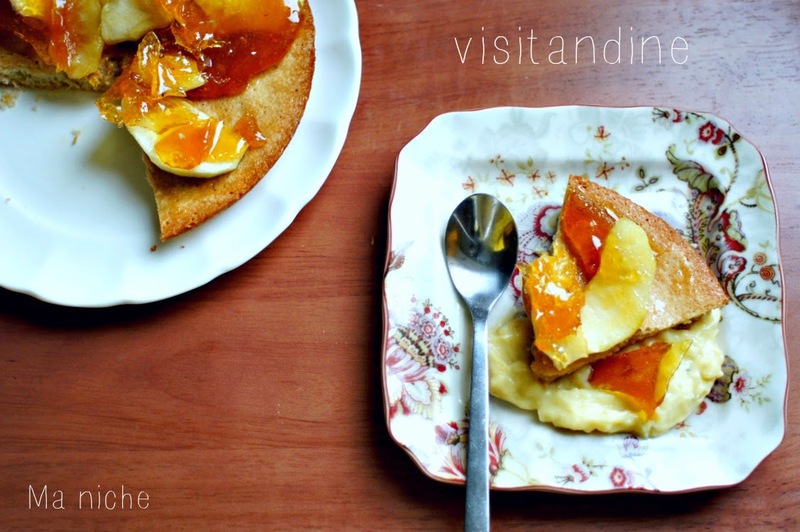 I like your apple galette version of Visitandine. It looks great.